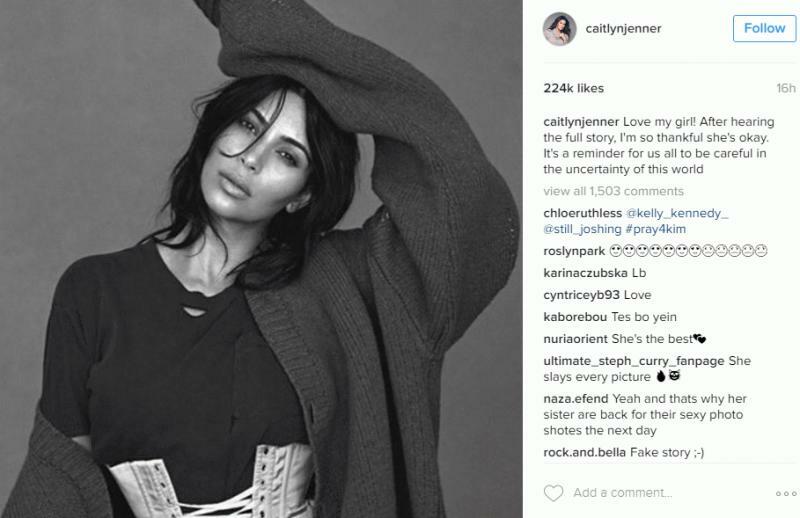 Los Angeles, CA, United States (4E) – Caitlyn Jenner is the first in the Kardashian-Jenner clan to talk about the robbery that Kim Kardashian underwent while in Paris as she posted a photo of the mother-of-two on Instagram . Kardashian was held at gunpoint and robbed of millions worth of her jewelries while at her hotel room in Paris for Paris Fashion Week. Jenner , Kardashian’s former stepfather, commented about the matter. Kardashian reportedly had her mouth taped, her hands tied, and was placed in the bath tub of her hotel room’s bathroom. Her hairstylist and good friend was able to call Kardashian’s bodyguard, her sister Kourtney , and her mother Kris. The Kardashian-Jenner girls have been silent about the incident. Kardashian is said to be in New York now in her rented apartment and many of her family and friends have been spotted in and out of the building such as her sisters, her mom, her husband, Chrissy Teigen , and more. Security guards are also watching over the building. It was reported days ago that a total of five masked men wearing police uniforms attacked Kardashian . Only two men went inside the room of Kardashian . A source shared that Kardashian is emotionally damaged now and is very much shaken up with what happened to her. She is reportedly more than grateful that she survived the ordeal and was beyond thankful that her two kids, North and Saint West, were not with him during the attack. Her best friend, Jonathan Cheban , also commented on Kardashian’s status saying that she is not doing so good. He did not provide further details.